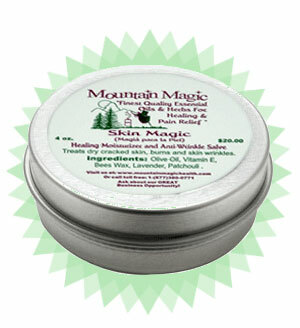 Skin Magic works great on dry cracked skin, sunburns, burns, rashes, calluses, age spots, and for wrinkle prevention. Use it as an anti-wrinkle facial moisturizer. It's also great for the diabetic's dry feet, for people who work outside and is even great for mountain climbers. People say when used daily after a shower when your pores are open, it will get rid of those painful cracks in a week or less. This product is very concentrated and typically lasts up to 1 year! It contains: Olive Oil, Vitamin E, Bees wax, Lavender and Patchouli Oil. 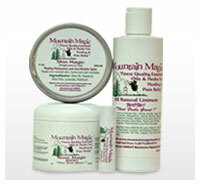 Skin Magic contains no artificial chemicals, petroleum products or animal products. I suffer chronic pain with severe spinal stenosis in both my upper and lower back. Of all the creams and ointments I have tried this is the best by far. It helps ease some of that pain and allows me to be somewhat more mobile. I am grateful for this product.